(l-r) Library Board of Trustees meet with the former Governor. 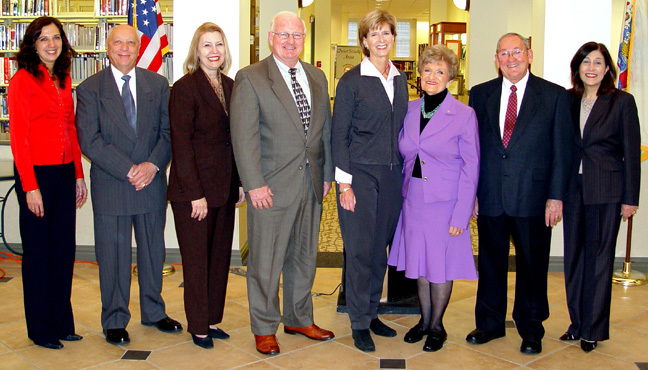 (l-r) Lisa Traina, Thomas Verrastro, Library Director Michele Reutty, Mayor Ronald R. Jones, former Governor Christie Todd Whitman, former Mayor and Assemblywoman Rose Marie Heck, Peter Gallo Jr., Maryetta Saccomano. Through the auspices of former Mayor and Assemblywoman Rose M. Heck, former Gov. Christine Todd Whitman made a special appearance at 1 p.m. on November 22 in the Hasbrouck Heights Free Public Library located on the second floor of the Municipal Building. Five years ago at the Free Public Library of Hasbrouck Heights, Governor Whitman signed into legislation the Library Construction bill sponsored by Assemblywoman Rose Marie Heck. This provided for $700,000 of support for this Boroughs Library construction project, and benefited dozens of libraries across the state in providing matching funds for construction, renovation and expansion. Library Director Michele Reutty gave Ms. Whitman a tour of the Hasbrouck Heights Free Public Library which directly benefited from the former Governors efforts. Governor Whitman gave a brief talk about her experiences as Governor of New Jersey and Head of the Environmental Protection Agency. She signed copies of her New York Times Bestseller, "Its My Party, Too."